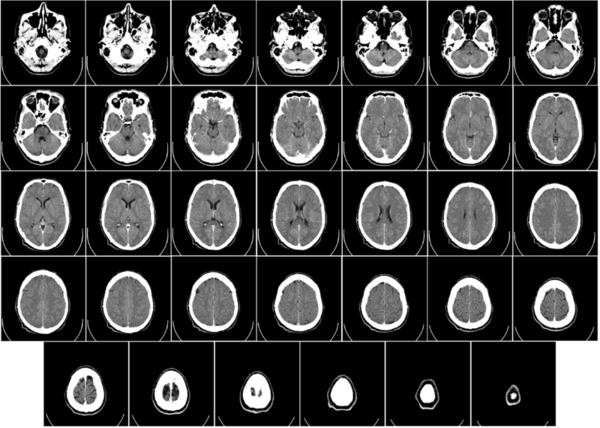 Computed tomography (CT) is a medical imaging method employing tomography. Digital geometry processing is used to generate a three-dimensional image of the inside of an object from a large series of two-dimensional X-ray images taken around a single axis of rotation. The word "tomography" is derived from the Greek tomos (slice) and graphein (to write). CT produces a volume of data that can be manipulated, through a process known as windowing, to identify various structures based on their ability to block the X-ray (Röntgen) beam. Although historically the images generated were in the axial or transverse plane (orthogonal to the long axis of the body), modern scanners allow this body of data to be reformatted in various planes or even as volumetric (3D) representations of structures. Although most commonly used in medicine, CT is also used in other fields, such as nondestructive materials testing. Another example is the DigiMorph project at the University of Texas at Austin which uses a CT scanner to study biological and paleontological specimens. Computed tomography was originally known as the "EMI scan" as it was developed at a research branch of EMI, a company best known today for its music and recording business. It was later known as computed axial tomography (CAT or CT scan) and body section röntgenography. In the early 1900s, the Italian radiologist Alessandro Vallebona proposed a method to represent a single slice of the body on the radiographic film. This method was known as tomography. The idea is based on simple principles of projective geometry: moving synchronously and in opposite directions the X-ray tube and the film, which are connected together by a rod whose pivot point is the focus; the image created by the points on the focal plane appears sharper, while the images of the other points annihilate as noise. This is only marginally effective, as blurring occurs only in the "x" plane. There are also more complex devices which can move in more than one plane and perform more effective blurring. Tomography had been one of the pillars of radiologic diagnostics until the late 1970s, when the availability of minicomputers and of the transverse axial scanning method, this last due to the work of Godfrey Hounsfield and Allan McLeod Cormack, gradually supplanted it as the modality of CT. The first commercially viable CT scanner was invented by Sir Godfrey Hounsfield in Hayes, United Kingdom at EMI Central Research Laboratories using X-rays. Hounsfield conceived his idea in 1967, and it was publicly announced in 1972. Allan McLeod Cormack of Tufts University in Massachusetts independently invented a similar process, and both Hounsfield and Cormack shared the 1979 Nobel Prize in Medicine. The original 1971 prototype took 160 parallel readings through 180 angles, each 1° apart, with each scan taking a little over five minutes. The images from these scans took 2.5 hours to be processed by algebraic reconstruction techniques on a large computer. The scanner had a single photomultiplier detector, and operated on the Translate/Rotate principle. It has been claimed that thanks to the success of The Beatles, EMI could fund research and build early models for medical use. The first production X-ray CT machine (in fact called the "EMI-Scanner") was limited to making tomographic sections of the brain, but acquired the image data in about 4 minutes (scanning two adjacent slices), and the computation time (using a Data General Nova minicomputer) was about 7 minutes per picture. This scanner required the use of a water-filled Perspex tank with a pre-shaped rubber "head-cap" at the front, which enclosed the patient's head. The water-tank was used to reduce the dynamic range of the radiation reaching the detectors (between scanning outside the head compared with scanning through the bone of the skull). The images were relatively low resolution, being composed of a matrix of only 80 x 80 pixels. The first EMI-Scanner was installed in Atkinson Morley Hospital in Wimbledon, England, and the first patient brain-scan was made with it in 1972. In the United State, the first installation was at the Mayo Clinic. As a tribute to the impact of this system on medical imaging the Mayo Clinic has an EMI scanner on display in the Radiology Department. The first CT system that could make images of any part of the body and did not require the "water tank" was the ACTA (Automatic Computerized Transverse Axial) scanner designed by Robert S. Ledley, DDS at Georgetown University. This machine had 30 photomultiplier tubes as detectors and completed a scan in only 9 translate/rotate cycles, much faster than the EMI-scanner. It used a DEC PDP11/34 minicomputer both to operate the servo-mechanisms and to acquire and process the images. The Pfizer drug company acquired the prototype from the university, along with rights to manufacture it. Pfizer then began making copies of the prototype, calling it the "200FS" (FS meaning Fast Scan), which were selling as fast as they could make them. This unit produced images in a 256x256 matrix, with much better definition than the EMI-Scanner's 80x80. A form of tomography can be performed by moving the X-ray source and detector during an exposure. Anatomy at the target level remains sharp, while structures at different levels are blurred. By varying the extent and path of motion, a variety of effects can be obtained, with variable depth of field and different degrees of blurring of 'out of plane' structures. Although largely obsolete, conventional tomography is still used in specific situations such as dental imaging (orthopantomography) or in intravenous urography. Digital tomosynthesis combines digital image capture and processing with simple tube/detector motion as used in conventional radiographic tomography—although there are some similarities to CT, it is a separate technique. In CT, the source/detector makes a complete 360-degree rotation about the subject obtaining a complete set of data from which images may be reconstructed. In digital tomosynthesis, only a small rotation angle (e.g. 40 degrees) with a small number of discrete exposures (e.g. 10) are used. This incomplete set of data can be digitally processed to yield images similar to conventional tomography with a limited depth of field. However, because the image processing is digital, a series of slices at different depths and with different thicknesses can be reconstructed from the same acquisition, saving both time and radiation exposure. Because the data acquired is incomplete, tomosynthesis is unable to offer the extremely narrow slice widths that CT offers. However, higher resolution detectors can be used, allowing very-high in-plane resolution, even if the Z-axis resolution is poor. The primary interest in tomosynthesis is in breast imaging, as an extension to mammography, where it may offer better detection rates, with little extra increase in radiation exposure. Reconstruction algorithms for tomosynthesis are significantly different from conventional CT, as the conventional filtered back projection algorithm requires a complete set of data. Iterative algorithms based upon expectation maximization are most commonly used, but are extremely computationally intensive. Some manufacturers have produced practical systems using commercial GPUs to perform the reconstruction. During the Radiological Society of North America (RSNA) in 2007, Toshiba Medical Systems introduced the world's first dynamic volume CT system, Aquilion ONE. This 320-slice CT scanner, with its 16 cm anatomical coverage, can scan entire organs such as heart and brain, in just one single rotation, thereby also enabling dynamic processes such as blood flow and function to be observed. Whereas patients exhibiting symptoms of a heart attack or stroke have until now normally had to submit to a variety of examinations preparatory to a precise diagnosis, all of which together took up a considerable amount of time, with dynamic volume CT this can be decreased to a matter of minutes and one single examination. Functional imaging can thus be performed rapidly, with the least possible radiation and contrast dose combined with very high precision. A Scout image is used in planning the exam and to establish where the target organs are located. The beginning and end of the scan are set by the target region and the location of the patient on the table. Once the Scout image is created, it is used to determine the extent of the desired Axial/Helical scan. During the Scout scan the gantry is rotated to a fixed position and the table is translated as x-ray is delivered. The image appears similar to a radiograph. In axial "step and shoot" acquisitions each slice/volume is taken and then the table is incremented to the next location. 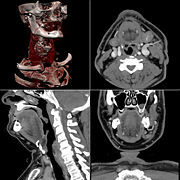 In multislice scanners each location is multiple slices and represents a volume of the patient anatomy. Tomographic reconstruction is used to generate Axial images. A cine acquisition is used when the temporal nature is important. This is used in Perfusion applications to evaluate blood flow, blood volume and mean transit time. Cine is a time sequence of axial images. In a Cine acquisition the cradle is stationary and the gantry rotates continuously. X-ray is delivered at a specified interval and duration. A Digitally Reconstructed Radiograph is a simulation of a conventional 2D x-ray image, created from computed tomography (CT) data. A radiograph, or conventional x-ray image, is a single 2D view of total x-ray absorption through the body along a given axis. Two objects (say, bones) in front of one another will overlap in the image. By contrast, a 3D CT image gives a volumetric representation. (Earlier CT data sets were better thought of as a set of 2D cross sectional images.) Sometimes one must compare CT data to a classical radiograph, and this can be done by comparing a DRR based on the CT data. An early example of their use is the beam's eye view (BEV) as used in radiotherapy planning. In this application, a BEV is created for a specific patient and is used to help plan the treatment. DRRs are created by summing CT intensities along a ray from each pixel to the simulated x-ray source. Since 1993, the Visible Human Project (VHP) has made full body CT data available to researchers. This has allowed several universities and commercial companies to try and create DRR's. These have been suggested as useful for training simulations in Radiology and Diagnostic Radiography. It takes a significant number of calculations to create a summative 3D image from a large amount of 2D data. This is an area of medical science and education that has benefited from the advancing of graphics card technology, driven by the computer games industry. Another novel use of DRR's is in identification of the dead from old radiographic records by comparing them to DRR's created from CT data. Electron beam tomography (EBCT) was introduced in the early 1980s, by medical physicist Andrew Castagnini, as a method of improving the temporal resolution of CT scanners. Because the X-ray source has to rotate by over 180 degrees in order to capture an image, the technique is inherently unable to capture dynamic events or movements that are quicker than the rotation time. Instead of rotating a conventional X-ray tube around the patient, the EBCT machine houses a huge vacuum tube in which an electron beam is electro-magnetically steered towards an array of tungsten X-ray anodes arranged circularly around the patient. Each anode is hit in turn by the electron beam and emits X-rays that are collimated and detected as in conventional CT. The lack of moving parts allows very quick scanning, with single slice acquisition in 50-100 ms, making the technique ideal for capturing images of the heart. EBCT has found particular use for assessment of coronary artery calcium, a means of predicting risk of coronary artery disease. The very high cost of EBCT equipment, and its poor flexibility (EBCT scanners are essentially single-purpose cardiac scanners), has led to poor uptake; fewer than 150 of these scanners have been installed worldwide. EBCT's role in cardiac imaging is rapidly being supplanted by high-speed multi-detector CT, which can achieve near-equivalent temporal resolution with much faster z-axis coverage. Helical, also called spiral, CT was first introduced by Slavin PE in March, 1969 (US Patent 3432657,"X-RAY HELICAL SCANNING MEANS FOR DISPLAYING AN IMAGE OF AN OBJECT WITHIN THE BODY BEING SCANNED"). 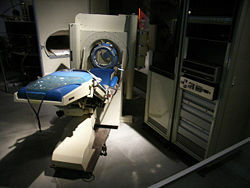 In older CT scanners, the X-ray source would move in a circular fashion to acquire a single 'slice', once the slice had been completed, the scanner table would move to position the patient for the next slice; meanwhile the X-ray source/detectors would reverse direction to avoid tangling their cables. In helical CT the X-ray source (and detectors in third-generation designs) are attached to a freely rotating gantry. During a scan, the table moves the patient smoothly through the scanner; the name derives from the helical path traced out by the X-ray beam. It was the development of two technologies that made helical CT practical: slip rings to transfer power and data on and off the rotating gantry, and the switched mode power supply powerful enough to supply the X-ray tube, but small enough to be installed on the gantry. The major advantage of helical scanning compared to the traditional shoot-and-step approach, is speed; a large volume can be covered in 20-60 seconds. This is advantageous for a number or reasons: 1) often the patient can hold their breath for the entire study, reducing motion artifacts, 2) it allows for more optimal use of intravenous contrast enhancement, and 3) the study is quicker than the equivalent conventional CT permitting the use of higher resolution acquisitions in the same study time. The data obtained from spiral CT is often well-suited for 3D imaging because of the lack of motion mis-registration and the increased out of plane resolution. These major advantages led to the rapid rise of helical CT as the most popular type of CT technology. Despite the advantages of helical scanning, there are a few circumstances where it may not be desirable—there is, of course, no difficulty in configuring a helical capable scanner for scanning in shoot-and-step mode. All other factors being equal, helical CT has slightly lower z-axis resolution than step-and-shoot (due to the continual movement of the patient). Where z-resolution is critical but where it is undesirable to scan at a higher resolution setting (due to the higher radiation exposure required) e.g. brain imaging, step-and-shoot may still be the preferred method. Multislice CT scanners are similar in concept to the helical or spiral CT but there are multiple detector rings. It began with two rings in the mid 1990s, with a 2 solid state ring model designed and built by Elscint (Haifa) called CT TWIN, with one second rotation (1993): It was followed by other manufacturers. Later, it was presented 4, 8, 16, 32, 40 and 64 detector rings, with increasing rotation speeds. Current models (2007) have up to 3 rotations per second, and isotropic resolution of 0.35 mm voxels with z-axis scan speed of up to 18 cm/s. This resolution exceeds that of High Resolution CT techniques with single-slice scanners, yet it is practical to scan adjacent, or overlapping, slices—however, image noise and radiation exposure significantly limit the use of such resolutions. The major benefit of multi-slice CT is the increased speed of volume coverage. This allows large volumes to be scanned at the optimal time following intravenous contrast administration; this has particularly benefitted CT angiography techniques—which rely heavily on precise timing to ensure good demonstration of arteries. Computer power permits increasing postprocessing capabilities on workstations. Bone suppression, volume rendering in real time, with a natural visualization of internal organs and structures, and automated volume reconstruction has drastically changed the way diagnostic is performed on CT studies and this models become true volumetric scanners. The ability of multi-slice scanners to achieve isotropic resolution even on routine studies means that maximum image quality is not restricted to images in the axial plane—and studies can be freely viewed in any desired plane. Siemens introduced a CT model with dual X-ray tube and dual array of 32 slice detectors, at the 2005 Radiological Society of North America (RSNA) medical meeting. Dual sources increase the temporal resolution by reducing the rotation angle required to acquire a complete image, thus permitting cardiac studies without the use of heart rate lowering medication, as well as permitting imaging of the heart in systole. The use of two x-ray units makes possible the use of dual energy imaging, which allows an estimate of the average atomic number in a voxel, as well as the total attenuation. This permits automatic differentiation of calcium (e.g. in bone, or diseased arteries) from iodine (in contrast medium) or titanium (in stents)—which might otherwise be impossible to differentiate. It may also improve the characterization of tissues allowing better tumor differentiation. This system simply uses two separate 32-slice detectors with two separate X-Ray tubes with flying focus. The generated data is 64 axial images per rotation (only in cardiac scans). 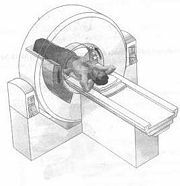 At RSNA 2007, Philips announced a 128x2-slice scanner with a flying focus having 8 cm coverage per rotation while Toshiba announced a "dynamic volume" scanner based on 320 slices having 16 cm coverage per rotation. The majority of published data with regard to both technical and clinical aspects of the systems have been related to the prototype unit made by Toshiba Medical Systems. The recent three month Beta installation at Johns Hopkins using a Toshiba system tested the clinical capabilities of this technology. The technology currently remains in a development phase but has demonstrated the potential to significantly reduce radiation exposure by eliminating the requirement for a helical examination in both cardiac CT angiography and whole brain perfusion studies for the evaluation of stroke. Inverse geometry CT (IGCT) is a novel concept which is being investigated as refinement of the classic third-generation CT design. Although the technique has been demonstrated on a laboratory proof-of-concept device, it remains to be seen whether IGCT is feasible for a practical scanner. IGCT reverses the shapes of the detector and X-ray sources. The conventional third-generation CT geometry uses a point source of X-rays, which diverge in a fan beam to act on a linear array of detectors. In multidetector computed tomography (MDCT), this is extended in 3 dimensions to a conical beam acting on a 2D array of detectors. The IGCT concept, conversely, uses an array of highly collimated X-ray sources which act on a point detector. By using a principle similar to electron beam tomography (EBCT), the individual sources can be activated in turn by steering an electron beam onto each source target. The rationale behind IGCT is that it avoids the disadvantages of the cone-beam geometry of third generation MDCT. As the z-axis width of the cone beam increases, the quantity of scattered radiation reaching the detector also increases, and the z-axis resolution is thereby degraded—because of the increasing z-axis distance that each ray must traverse. This reversal of roles has extremely high intrinsic resistance to scatter; and, by reducing the number of detectors required per slice, it makes the use of better performing detectors (e.g. ultra-fast photon counting detectors) more practical. Because a separate detector can be used for each 'slice' of sources, the conical geometry can be replaced with an array of fans, permitting z-axis resolution to be preserved. pQCT or QCT devices are optimized for high precision measurements of physical properties of bone such as bone density and bone geometry. In comparison to the commonly used DXA system which measures bone mass only (BMD), QCT systems can determine bone strength as a mechanical property and the resulting fracture risk. Hence one outcome parameter is the Stress-Strain Index (SSI) comparing bone strength to results of three point bending tests commonly used for mechanical material tests. Typical application is Osteoporosis diagnostics where single slices at the Tibia or the Radius are measured resulting in a very low local Radiation dose of 1-2 μSv. Synchrotron X-ray tomographic microscopy is a 3-D scanning technique that allows non-invasive high definition scans of objects with details as fine as a thousandth of a millimeter, meaning it has two to 3,000 times the resolution of a traditional medical CT scan. 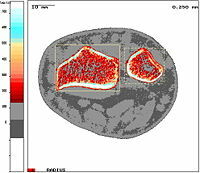 Synchrotron X-ray tomographic microscopy has been applied in the field of paleontology to allow non-destructive internal examination of fossils, including fossil embryos to be made. Scientists feel this technology has the potential to revolutionize the field of paleontology. The first team to use the technique have published their findings in Nature, which they believe "could roll back the evolutionary history of arthropods like insects and spiders." Archaeologists are increasingly turning to Synchrotron X-ray tomographic microscopy as a non-destructive means to examine ancient specimens. X-ray Tomography is a branch of X-ray microscopy. A series of projection images are used to calculate a three dimensional reconstruction of an object. The technique has found many applications in materials science and later in biology and biomedical research. In terms of the latter, the National Center for X-ray Tomography (NCXT) is one of the principal developers of this technology, in particular for imaging whole, hydrated cells. Since its introduction in the 1970s, CT has become an important tool in medical imaging to supplement X-rays and medical ultrasonography. Although it is still quite expensive, it is the gold standard in the diagnosis of a large number of different disease entities. It has more recently begun to also be used for preventive medicine or screening for disease, for example CT colonography for patients with a high risk of colon cancer. Although a number of institutions offer full-body scans for the general population, this practice remains controversial due to its lack of proven benefit, cost, radiation exposure, and the risk of finding 'incidental' abnormalities that may trigger additional investigations. CT can be used for detecting both acute and chronic changes in the lung parenchyma, that is, the internals of the lungs. It is particularly relevant here because normal two dimensional x-rays do not show such defects. A variety of different techniques are used depending on the suspected abnormality. For evaluation of chronic interstitial processes (emphysema, fibrosis, and so forth), thin sections with high spatial frequency reconstructions are used—often scans are performed both in inspiration and expiration. This special technique is called High resolution CT (HRCT). HRCT is normally done with thin section with skipped areas between the thin sections. Therefore it produces a sampling of the lung and not continuous images. Continuous images are provided in a standard CT of the chest. For detection of airspace disease (such as pneumonia) or cancer, relatively thick sections and general purpose image reconstruction techniques may be adequate. IV contrast may also be used as it clarifies the anatomy and boundaries of the great vessels and improves assessment of the mediastinum and hilar regions for lymphadenopathy; this is particularly important for accurate assessment of cancer. CT angiography of the chest is also becoming the primary method for detecting pulmonary embolism (PE) and aortic dissection, and requires accurately timed rapid injections of contrast (Bolus Tracking) and high-speed helical scanners. CT is the standard method of evaluating abnormalities seen on chest X-ray and of following findings of uncertain acute significance. CT pulmonary angiogram (CTPA) is a medical diagnostic test used to diagnose pulmonary embolism (PE). It employs computed tomography to obtain an image of the pulmonary arteries. It is a preferred choice of imaging in the diagnosis of PE due to its minimally invasive nature for the patient, whose only requirement for the scan is a cannula (usually a 20G). MDCT (multi detector CT) scanners give the optimum resolution and image quality for this test. Images are usually taken on a 0.625 mm slice thickness, although 2 mm is sufficient. Fifty to 100 mls of contrast is given to the patient at a rate of 4 ml/s. The tracker/locator is placed at the level of the Pulmonary Arteries, which sit roughly at the level of the carina. Images are acquired with the maximum intensity of radio-opaque contrast in the Pulmonary Arteries. This is done using bolus tracking. CT machines are now so sophisticated that the test can be done with a patient visit of 5 minutes with an approximate scan time of only 5 seconds or less. A normal CTPA scan will show the contrast filling the pulmonary vessels, looking bright white. Ideally the aorta should be empty of contrast, to reduce any partial volume artifact which may result in a false positive. Any mass filling defects, such as an embolus, will appear dark in place of the contrast, filling / blocking the space where blood should be flowing into the lungs. With the advent of subsecond rotation combined with multi-slice CT (up to 64-slice), high resolution and high speed can be obtained at the same time, allowing excellent imaging of the coronary arteries (cardiac CT angiography). Images with an even higher temporal resolution can be formed using retrospective ECG gating. In this technique, each portion of the heart is imaged more than once while an ECG trace is recorded. The ECG is then used to correlate the CT data with their corresponding phases of cardiac contraction. Once this correlation is complete, all data that were recorded while the heart was in motion (systole) can be ignored and images can be made from the remaining data that happened to be acquired while the heart was at rest (diastole). In this way, individual frames in a cardiac CT investigation have a better temporal resolution than the shortest tube rotation time. Because the heart is effectively imaged more than once (as described above), cardiac CT angiography results in a relatively high radiation exposure around 12 mSv. For the sake of comparison, a chest X-ray carries a dose of approximately 0.02 to 0.2 mSv and natural background radiation exposure is around 0.01 mSv/day. Thus, cardiac CTA is equivalent to approximately 100-600 chest X-rays or over 3 years worth of natural background radiation. Methods are available to decrease this exposure, however, such as prospectively decreasing radiation output based on the concurrently acquired ECG (aka tube current modulation.) This can result in a significant decrease in radiation exposure, at the risk of compromising image quality if there is any arrhythmia during the acquisition. The significance of radiation doses in the diagnostic imaging range has not been proven, although the possibility of inducing an increased cancer risk across a population is a source of significant concern. This potential risk must be weighed against the competing risk of not performing a test and potentially not diagnosing a significant health problem such as coronary artery disease. It is uncertain whether this modality will replace invasive coronary catheterization. Currently, it appears that the greatest utility of cardiac CT lies in ruling out coronary artery disease rather than ruling it in. This is because the test has a high sensitivity (greater than 90 percent) and thus a negative test result means that a patient is very unlikely to have coronary artery disease and can be worked up for other causes of their chest symptoms. This is termed a high negative predictive value. A positive result is less conclusive and often will be confirmed (and possibly treated) with subsequent invasive angiography. The positive predictive value of cardiac CTA is estimated at approximately 82 percent and the negative predictive value is around 93 percent. Dual Source CT scanners, introduced in 2005, allow higher temporal resolution by acquiring a full CT slice in only half a rotation, thus reducing motion blurring at high heart rates and potentially allowing for shorter breath-hold time. This is particularly useful for ill patients who have difficulty holding their breath or who are unable to take heart-rate lowering medication. The speed advantages of 64-slice MSCT have rapidly established it as the minimum standard for newly installed CT scanners intended for cardiac scanning. Manufacturers are now actively developing 256-slice and true 'volumetric' scanners, primarily for their improved cardiac scanning performance. The latest MSCT scanners acquire images only at 70-80 percent of the R-R interval (late diastole). This prospective gating can reduce effective dose from 10-15mSv to as little as 1.2mSv in follow-up patients acquiring at 75 percent of the R-R interval. Effective doses at a centre with well trained staff doing coronary imaging can average less than the doses for conventional coronary angiography. CT is a sensitive method for diagnosis of abdominal diseases. It is used frequently to determine stage of cancer and to follow progress. It is also a useful test to investigate acute abdominal pain (especially of the lower quadrants, whereas ultrasound is the preferred first line investigation for right upper quadrant pain). Renal stones, appendicitis, pancreatitis, diverticulitis, abdominal aortic aneurysm, and bowel obstruction are conditions that are readily diagnosed and assessed with CT. CT is also the first line for detecting solid organ injury after trauma. Oral and/or rectal contrast may be used depending on the indications for the scan. A dilute (2 percent w/v) suspension of barium sulfate is most commonly used. The concentrated barium sulfate preparations used for fluoroscopy e.g. barium enema are too dense and cause severe artifacts on CT. Iodinated contrast agents may be used if barium is contraindicated (for example, suspicion of bowel injury). Other agents may be required to optimize the imaging of specific organs, such as rectally administered gas (air or carbon dioxide) or fluid (water) for a colon study, or oral water for a stomach study. CT has limited application in the evaluation of the pelvis. For the female pelvis in particular, ultrasound and MRI are the imaging modalities of choice. Nevertheless, it may be part of abdominal scanning (e.g. for tumors), and has uses in assessing fractures. CT is also used in osteoporosis studies and research alongside dual energy X-ray absorptiometry (DXA). Both CT and DXA can be used to assess bone mineral density (BMD) which is used to indicate bone strength, however CT results do not correlate exactly with DXA (the gold standard of BMD measurement). CT is far more expensive, and subjects patients to much higher levels of ionizing radiation, so it is used infrequently. CT is often used to image complex fractures, especially ones around joints, because of its ability to reconstruct the area of interest in multiple planes. Fractures, ligamentous injuries and dislocations can easily be recognized with a 0.2 mm resolution. First, CT completely eliminates the superimposition of images of structures outside the area of interest. Second, because of the inherent high-contrast resolution of CT, differences between tissues that differ in physical density by less than 1 percent can be distinguished. Third, data from a single CT imaging procedure consisting of either multiple contiguous or one helical scan can be viewed as images in the axial, coronal, or sagittal planes, depending on the diagnostic task. This is referred to as multiplanar reformatted imaging. CT is regarded as a moderate to high radiation diagnostic technique. While technical advances have improved radiation efficiency, there has been simultaneous pressure to obtain higher-resolution imaging and use more complex scan techniques, both of which require higher doses of radiation. The improved resolution of CT has permitted the development of new investigations, which may have advantages; compared to conventional angiography for example, CT angiography avoids the invasive insertion of an arterial catheter and guidewire; CT colonography (also known as virtual colonoscopy or VC for short) may be as useful as a barium enema for detection of tumors, but may use a lower radiation dose. CT VC is increasingly being used in the UK as a diagnostic test for bowel cancer and can negate the need for a colonoscopy. The greatly increased availability of CT, together with its value for an increasing number of conditions, has been responsible for a large rise in popularity. So large has been this rise that, in the most recent comprehensive survey in the United Kingdom, CT scans constituted 7 percent of all radiologic examinations, but contributed 47 percent of the total collective dose from medical X-ray examinations in 2000/2001. Increased CT usage has led to an overall rise in the total amount of medical radiation used, despite reductions in other areas. In the United States and Japan for example, there were 26 and 64 CT scanners per 1 million population in 1996. In the United States, there were about 3 million CT scans performed in 1980, compared to an estimated 62 million scans in 2006. The radiation dose for a particular study depends on multiple factors: volume scanned, patient build, number and type of scan sequences, and desired resolution and image quality. Additionally, two helical CT scanning parameters that can be adjusted easily and that have a profound effect on radiation dose are tube current and pitch. The increased use of CT scans has been the greatest in two fields: screening of adults (screening CT of the lung in smokers, virtual colonoscopy, CT cardiac screening and whole-body CT in asymptomatic patients) and CT imaging of children. Shortening of the scanning time to around one second, eliminating the strict need for subject to remain still or be sedated, is one of the main reasons for large increase in the pediatric population (especially for the diagnosis of appendicitis). CT scans of children have been estimated to produce non-negligible increases in the probability of lifetime cancer mortality leading to calls for the use of reduced current settings for CT scans of children. These calculations are based on the assumption of a linear relationship between radiation dose and cancer risk; this claim is controversial, as some but not all evidence shows that smaller radiation doses are less harmful. It can be estimated that one in 500 children under 15 will die from cancer due to an abdominal CT scan, and one in 1500 children will die from brain cancer after head CT. The additional risk is still very low (0.35 percent) compared to the background risk of dying from cancer (23 percent). However, if these statistics are extrapolated to the current number of CT scans, the additional rise in cancer mortality could be 1.5 to 2 percent. Furthermore, certain conditions can require children to be exposed to multiple CT scans. Again, these calculations can be problematic because the assumptions underlying them could overestimate the risk. CT scans can be performed with different settings for lower exposure in children, although these techniques are often not employed. 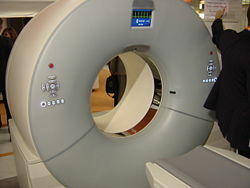 Surveys have suggested that currently, many CT scans are performed unnecessarily. Ultrasound scanning or magnetic resonance imaging are alternatives (for example, in appendicitis or brain imaging) without the risk of radiation exposure. Although CT scans come with an additional risk of cancer, especially in children, the benefits that stem from their use outweighs the risk in many cases. Studies support informing parents of the risks of pediatric CT scanning. For comparison, survivors of the atomic bombings of Hiroshima and Nagasaki were exposed to an average of 40 mSv of radiation, and studies in radiation workers in the nuclear industry estimated they were exposed to an average dose of 20 mSv. In both cases, there was an increased risk of dying from cancer. Depending on the technique and the patient, these doses are comparable to two or three CT scans. Because CT scans rely on intravenously administered contrast agents in order to provide superior image quality, there is a low but non-negligible level of risk associated with the contrast agents themselves. Certain patients may experience severe and potentially life-threatening allergic reactions to the contrast dye. The contrast agent may also induce kidney damage. The risk of this is increased with patients who have preexisting renal insufficiency, preexisting diabetes, or reduced intravascular volume. In general, if a patient has normal kidney function, then the risks of contrast nephropathy are negligible. Patients with mild kidney impairment are usually advised to ensure full hydration for several hours before and after the injection. For moderate kidney failure, the use of iodinated contrast should be avoided; this may mean using an alternative technique instead of CT e.g. MRI. Perhaps paradoxically, patients with severe renal failure requiring dialysis do not require special precautions, as their kidneys have so little function remaining that any further damage would not be noticeable and the dialysis will remove the contrast agent. The main issue within radiology today is how to reduce the radiation dose during CT examinations without compromising the image quality. Generally, a high radiation dose results in high quality images. A lower dose leads to increased image noise and results in unsharp images. Unfortunately, as the radiation dose increases, so does the associated risk of radiation induced cancer—even though this is extremely small. A radiation exposure of around 1200 mrem (similar to a 4-view mammogram) carried a radiation-induced cancer risk of about a million to one. However, there are several methods that can be used in order to lower the exposure to ionizing radiation during a CT scan. New software technology can significantly reduce the radiation dose. The software works as a filter which reduces random noise and enhances structures. In that way, it is possible to get high quality images and at the same time lower the dose by as much as 30 to 70 percent. Prior to every CT examination, evaluate the appropriateness of the exam whether it’s motivated or if another type of examination is more suitable. 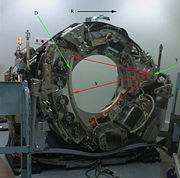 X-ray slice data is generated using an X-ray source that rotates around the object; X-ray sensors are positioned on the opposite side of the circle from the X-ray source. The earliest sensors were scintillation detectors, with photomultiplier tubes excited by (typically) sodium iodide crystals. Modern detectors use the ionization principle and are filled with low-pressure Xenon gas. Many data scans are progressively taken as the object is gradually passed through the gantry. They are combined together by the mathematical procedures known as tomographic reconstruction. The data are arranged in a matrix in memory, and each data point is convolved with its neighbors according with a seed algorithm using Fast Fourier Transform techniques. This dramatically increases the resolution of each Voxel (volume element). Then a process known as Back Projection essentially reverses the acquisition geometry and stores the result in another memory array. This data can then be displayed, photographed, or used as input for further processing, such as multi-planar reconstruction. Newer machines with faster computer systems and newer software strategies can process not only individual cross sections but continuously changing cross sections as the gantry, while the object to be imaged is slowly and smoothly slid through the X-ray circle. These are called helical or spiral CT machines. Their computer systems integrate the data of the moving individual slices to generate three dimensional volumetric information (3D-CT scan), in turn viewable from multiple different perspectives on attached CT workstation monitors. This type of data acquisition requires enormous processing power, as the data are arriving in a continuous stream and must be processed in real-time. In conventional CT machines, an X-ray tube and detector are physically rotated behind a circular shroud (see the image above right); in the electron beam tomography (EBT) the tube is far larger and higher power to support the high temporal resolution. The electron beam is deflected in a hollow funnel shaped vacuum chamber. X-rays are generated when the beam hits the stationary target. The detector is also stationary. This arrangement can result in very fast scans, but is extremely expensive. The data stream representing the varying radiographic intensity sensed at the detectors on the opposite side of the circle during each sweep is then computer processed to calculate cross-sectional estimations of the radiographic density, expressed in Hounsfield units. Sweeps cover 360 or just over 180 degrees in conventional machines, 220 degrees in EBT. CT is used in medicine as a diagnostic tool and as a guide for interventional procedures. Sometimes contrast materials such as intravenous iodinated contrast are used. This is useful to highlight structures such as blood vessels that otherwise would be difficult to delineate from their surroundings. Using contrast material can also help to obtain functional information about tissues. Pixels in an image obtained by CT scanning are displayed in terms of relative radiodensity. The pixel itself is displayed according to the mean attenuation of the tissue(s) that it corresponds to on a scale from -1024 to +3071 on the Hounsfield scale. A pixel is a two dimensional unit based on the matrix size and the field of view. When the CT slice thickness is also factored in, the unit is known as a Voxel, which is a three-dimensional unit. The phenomenon that one part of the detector cannot differ between different tissues is called the "Partial Volume Effect". That means that a big amount of cartilage and a thin layer of compact bone can cause the same attenuation in a voxel as hyperdense cartilage alone. Water has an attenuation of 0 Hounsfield units (HU) while air is -1000 HU, cancellous bone is typically +400 HU, cranial bone can reach 2000 HU or more (os temporale) and can cause artifacts. The attenuation of metallic implants depends on atomic number of the element used: Titanium usually has an amount of +1000 HU, iron steel can completely extinguish the X-ray and is therefore responsible for well-known line-artifacts in computed tomograms. Artifacts are caused by abrupt transitions between low- and high-density materials, which results in data values that exceed the dynamic range of the processing electronics. Although CT is a relatively accurate test, it is liable to produce artifacts, such as the following. These appear as dark lines which radiate away from sharp corners. It occurs because it is impossible for the scanner to 'sample' or take enough projections of the object, which is usually metallic. It can also occur when an insufficient X-ray tube current is selected, and insufficient penetration of the x-ray occurs. These artifacts are also closely tied to motion during a scan. 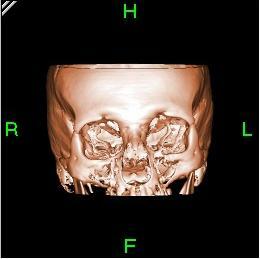 This type of artifact commonly occurs in head images around the pituitary fossa area. This appears as 'blurring' over sharp edges. It is due to the scanner being unable to differentiate between a small amount of high-density material (e.g. bone) and a larger amount of lower density (e.g. cartilage). The processor tries to average out the two densities or structures, and information is lost. This can be partially overcome by scanning using thinner slices. Probably the most common mechanical artifact, the image of one or many 'rings' appears within an image. This is usually due to a detector fault. This appears as graining on the image and is caused by a low signal to noise ratio. This occurs more commonly when a thin slice is used. It can also occur when the power supplied to the X-ray tube is insufficient to penetrate the anatomy. This is seen as blurring and/or streaking which is caused by movement of the object being imaged. This can give a 'cupped appearance'. It occurs when there is more attenuation in the center of the object than around the edge. This is easily corrected by filtration and software. Because contemporary CT scanners offer isotropic, or near isotropic, resolution, display of images does not need to be restricted to the conventional axial images. Instead, it is possible for a software program to build a volume by 'stacking' the individual slices one on top of the other. The program may then display the volume in an alternative manner. Multiplanar reconstruction (MPR) is the simplest method of reconstruction. A volume is built by stacking the axial slices. The software then cuts slices through the volume in a different plane (usually orthogonal). Optionally, a special projection method, such as maximum-intensity projection (MIP) or minimum-intensity projection (mIP), can be used to build the reconstructed slices. MPR is frequently used for examining the spine. Axial images through the spine will only show one vertebral body at a time and cannot reliably show the intervertebral discs. By reformatting the volume, it becomes much easier to visualize the position of one vertebral body in relation to the others. Modern software allows reconstruction in non-orthogonal (oblique) planes so that the optimal plane can be chosen to display an anatomical structure. This may be particularly useful for visualizing the structure of the bronchi as these do not lie orthogonal to the direction of the scan. For vascular imaging, curved-plane reconstruction can be performed. This allows bends in a vessel to be 'straightened' so that the entire length can be visualized on one image, or a short series of images. Once a vessel has been 'straightened' in this way, quantitative measurements of length and cross sectional area can be made, so that surgery or interventional treatment can be planned. MIP reconstructions enhance areas of high radiodensity, and so are useful for angiographic studies. mIP reconstructions tend to enhance air spaces so are useful for assessing lung structure. A threshold value of radiodensity is chosen by the operator (e.g. a level that corresponds to bone). A threshold level is set, using edge detection image processing algorithms. From this, a 3-dimensional model can be constructed and displayed on screen. Multiple models can be constructed from various different thresholds, allowing different colors to represent each anatomical component such as bone, muscle, and cartilage. However, the interior structure of each element is not visible in this mode of operation. Surface rendering is limited in that it will only display surfaces which meet a threshold density, and will only display the surface that is closest to the imaginary viewer. In volume rendering, transparency and colors are used to allow a better representation of the volume to be shown in a single image—e.g. the bones of the pelvis could be displayed as semi-transparent, so that even at an oblique angle, one part of the image does not conceal another. Where different structures have similar radiodensity, it can become impossible to separate them simply by adjusting volume rendering parameters. The solution is called segmentation, a manual or automatic procedure that can remove the unwanted structures from the image. Some slices of a cranial CT scan are shown below. The bones are whiter than the surrounding area. (Whiter means higher radiodensity.) Note the blood vessels (arrowed) showing brightly due to the injection of an iodine-based contrast agent. A volume rendering of this volume clearly shows the high density bones. After using a segmentation tool to remove the bone, the previously concealed vessels can now be demonstrated. ↑ Caroline Richmond, 2004, Obituary - Sir Godfrey Hounsfield. BMJ. 329(18):687. Retrieved November 10, 2008. ↑ The Beatles greatest gift... is to science. Whittington Hospital NHS Trust. Retrieved November 10, 2008. ↑ Press Release. Health Imaging. Retrieved November 10, 2008. ↑ JHM Now Testing Only 256-Slice CT Scanner in North America. JHU Gazette. Retrieved November 10, 2008. ↑ H. Sievänen, V. Koskue, A. Rauhio, P. Kannus, A. Heinonen, and I. Vuori, 1998, Peripheral Quantitative Computed Tomography in Human Long Bones: Evaluation of in Vitro and in Vivo Precision. J Bone Miner. Res. 13:S.871-882. PMID 9610752. ↑ M.B. Leonard, J. Shults, D.M. Elliot, V.A. Stallings, and B.S. Zemel, 2004, Interpretation of whole body dual energy X-ray absorptiometry measures in children: comparison with peripheral quantitative computed tomography. Bone. 34:S.1044-1052. ↑ S.A. Jamal, J. Gilbert, C. Gordon, and D.C. Bauer. Cortical PQCT Measures are Associated With Fractures in Dialysis Patients. J.o. Bone a. Mineral Res. 21(4):S.543-548. PMID 16598374. ↑ Schießl H., and J. Willnecker. 1997. New insights about the relationship between bone strength and muscle strength. Paediatric Osteology, Proceedings of the Second International Workshop, Cologne, Germany. 3-5 October 1997. New aspects of bone and muscle diagnostics. ↑ Jämsä, T., P. Jalovaara, Z. Peng, H.K. Väänänen, and J. Tuukkanen. 1998. Comparison of three-point bending test and peripheral quantitative computed tomography analysis in the evaluation of the strength of mouse femur and tibia. Bone. 23(2):155-61. PMID 9701475. ↑ A. Müller, E. Rüegsegger, and P. Rüegsegger, 1989, Peripheral QCT: a low-risk procedure to identify women predisposed to osteoporosis. Phys Med Biol. 34(6):741–9. PMID 2740441. ↑ H.M. Frost, 1997, Defining Osteopenias and Osteoporoses: Another View (With Insights From a New Paradigm). Bone. 20(5):385-391. PMID 9145234. ↑ Braun M.J., M.D. Meta, P. Schneider, C. Reiners. 1998. Clinical evaluation of a high-resolution new peripheral quantitative computerized tomography (pQCT) scanner for the bone densitometry at the lower limbs. Phys. Med. Biol. 43:S.2279-2294. PMID 9725604. ↑ Philip C.J. Donoghue, Stefan Bengtson, Xi-ping Dong, Neil J. Gostling, Therese Huldtgren, John A. Cunningham, Chongyu Yin, Zhao Yue, Fan Peng, and Marco Stampanoni, 2006, Synchrotron X-ray tomographic microscopy of fossil embryos. Nature. 443:680-3. Retrieved November 10, 2008. ↑ Breakthrough gives 3-D vision of life’s dawn. MSNBC. Retrieved November 10, 2008. ↑ Tiny fossils reveal inner secrets. BBC News. Retrieved November 10, 2008. ↑ 'Super-scope' to see hidden texts. BBC News. Retrieved November 10, 2008. ↑ D. Hart and B.F. Wall, 2002, Radiation exposure of the UK population from Medical and Dental X-ray examinations. NRPB report W-4. ↑ D. Hart and B.F. Wall, 2004, UK population dose from medical X-ray examinations. European Journal of Radiology. 50(3):285–291. Retrieved November 10, 2008. ↑ 19.0 19.1 19.2 19.3 19.4 19.5 19.6 19.7 D.J. Brenner, and E.J. Hall, 2007, Computed tomography—an increasing source of radiation exposure. N. Engl. J. Med. 357(22):2277–84. PMID 18046031. Retrieved November 10, 2008. ↑ F. Donnelly. et al. 2001, Minimizing Radiation Dose for Pediatric Body Applications of Single-Detector Helical CT. American Journal of Roentgenology. 176(2):303–306. Retrieved November 10, 2008. ↑ David J. Brenner, David et al. 2001, Estimated Risks of Radiation-Induced Fatal Cancer from Pediatric CT. American Journal of Roentgenology. 176: 289–296. PMID 11159059. Retrieved November 10, 2008. ↑ 22.0 22.1 22.2 D. Brenner, C. Elliston, E. Hall, and W. Berdon, 2001, Estimated risks of radiation-induced fatal cancer from pediatric CT. AJR Am J Roentgenol. 176(2): 289–96. PMID 11159059. Retrieved November 10, 2008. ↑ D.B. Larson, S.B. Rader, H.P. Forman, and L.Z. Fenton, 2007, Informing parents about CT radiation exposure in children: it's OK to tell them. AJR Am J Roentgenol. 189(2):271–5. PMID 17646450. Retrieved November 10, 2008. ↑ Peter Hunold, Florian M. Vogt, Axel Schmermund, Jörg F. Debatin, Gert Kerkhoff, Thomas Budde, Raimund Erbel, Klaus Ewen, and Jörg Barkhausen, 2003, Radiation Exposure during Cardiac CT: Effective Doses at Multi–Detector Row CT and Electron-Beam CT. Radiology 226: 145-152. Retrieved November 10, 2008. Bushong, Stewart C. 2000. Computed Tomography. New York, NY: McGraw-Hill, Health Professions Division. ISBN 0071343547. Kalender, Willi A. 2006. Computed Tomography: Fundamentals, System Technology, Image Quality, Applications. Erlangen, UK: Publicis Corporate Publishing. ISBN 3895782165. Seeram, Euclid. 2008. Computed Tomography: Physical Principles, Clinical Applications, and Quality Control. St. Louis, MO: Saunders. ISBN 1416028951. Free-source computed tomography online learning content for Radiologists and Radiographers. Open-source computed tomography simulator with educational tracing displays. idoimaging.com: Free software for viewing CT and other medical imaging files. CT Artefacts – by David Platten. DigiMorph – A library of 3D imagery based on CT scans of the internal and external structure of living and extinct plants and animals. This page was last modified on 16 March 2017, at 18:25.